Over the past few weeks, we’ve introduced you to artists Jayd Alex and Jade Ramos. Today, it’s our pleasure to introduce you to Professional Sculptor, Victoria Claire. Victoria who is losing her eyesight to Retinitis Pigmentosa (RP), is an ambassador for RP Fighting Blindness. Her key message—”Disability is not an impairment to creativity”—is clearly seen in her artwork. The sculptures Victoria creates isn’t her only expertise. As a talented musician, she also enjoys surfing, skateboarding, and inspiring others. Like many of the women featured on Blind Beauty, Victoria connected with us on Instagram. Next month, Victoria will be speaking at an upcoming conference in London. While at the conference, she will also unveil her new exhibition “Freedom In Acceptance.” If you are on Instagram, check out her exquisite bamboo long cane which is part of the exhibition. While the long cane may look different than the standard white mobility tool its purpose hasn’t changed. Regardless of customization applied, the long cane’s primary function is to detect obstacles in the path of its user. Victoria’s bamboo long cane is a beautiful work of art. What makes this cane so special are the Chinese symbols for “Freedom In Acceptance” burnt into it. This is a powerful statement that basically says with acceptance comes independence. When we lose our eyesight at times we can feel like we are losing control of our lives. However, we have a choice “Freedom In Acceptance” gives us this choice. What we love most about Victoria’s work is how the images alone evoke the sense of touch. Her pieces express movement and float like a graceful, elegant, ballerina. The smooth, shiny, rounded edges look soft yet at the same time, the pieces are bold. 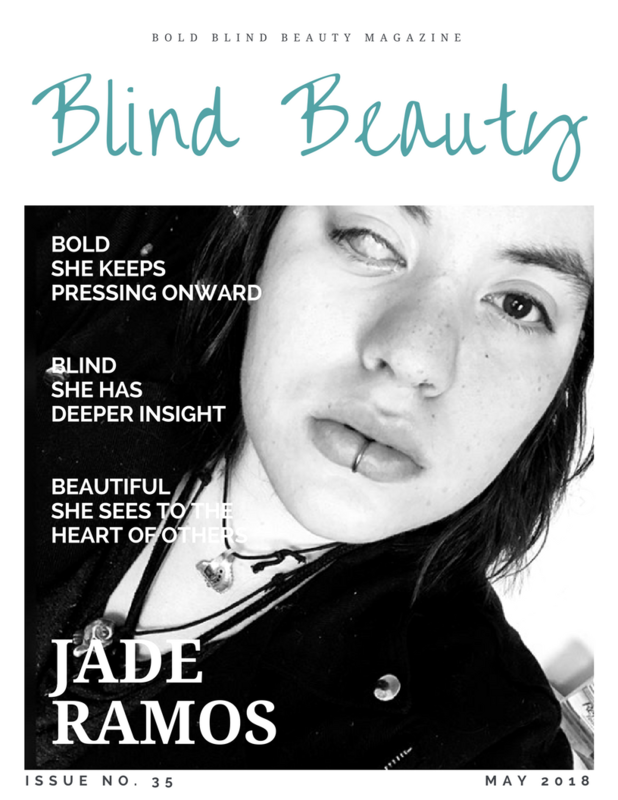 Blind Beauty is a mock fashion magazine cover. Victoria is on the cover sitting, leaning forward, and looking directly at the camera. Her straight blond hair parted in the middle frames her face. Wearing minimal makeup she is stunning with pink frosted lip color and intense green eyes. She is wearing a sleeveless black dress with a keyhole neckline. The Guide – A representation of peace, The Guide is a contemporary wooden sculpture of a dove in flight. The Guardian – A wooden sculpture of a vertical wing. Victoria Skateboarding – Victoria is using a skateboard on the pavement. Her long purple cane (aka white cane) is in her left helping her navigate. She’s wearing blue jeans, black sneakers & mitten, white winter jacket and a burgundy knit beanie. Image #1 | We See More, We Are More. Isn’t true if you can’t see it. Likewise, painting with words, the skill writers and creatives alike use, can fully engage our senses. There is power in both imagery and words. Marrying the two with image descriptions make stories come alive in the imaginations of people who are blind or visually impaired (VI). Take for example the 3 images within this post created by Digital Artist, Jayd Alex. Each of her pieces challenges us to view blindness from a different perspective. These gorgeous drawings show the vast spectrum of blindness and how people who are blind might appear. What I love about Jayd’s art is that it demystifies blindness by showing characters with strength, confidence, and their white canes. Ordinary people who cannot see yet are living their lives independently. Each of the images shows people who are well-groomed, poised, and fierce. Black & white partial sketch of a woman holding an identification (ID) cane in both hands. A braid can be seen laying on her right shoulder and she is professionally dressed in a jacket with rolled up sleeves and white cami. Fashionably dressed brown-skinned woman with wavy burgundy colored hair. She has a blue floppy hat on her head with blue oversized shades, white cold shoulder top with lace details around the shoulders and blue jeans. She is holding her white mobility cane in her right hand and she could easily be a runway model. This image is part of a new iPad painting. The image is a stylish white complexioned young woman with pink hair in a ponytail and loose wisps of hair on both sides of her face. She is wearing a purple three-quarter sleeve length top and matching choker with a full black skirt belted at the waist. In both hands, she is holding a shorter identification cane used to indicate she has low vision. 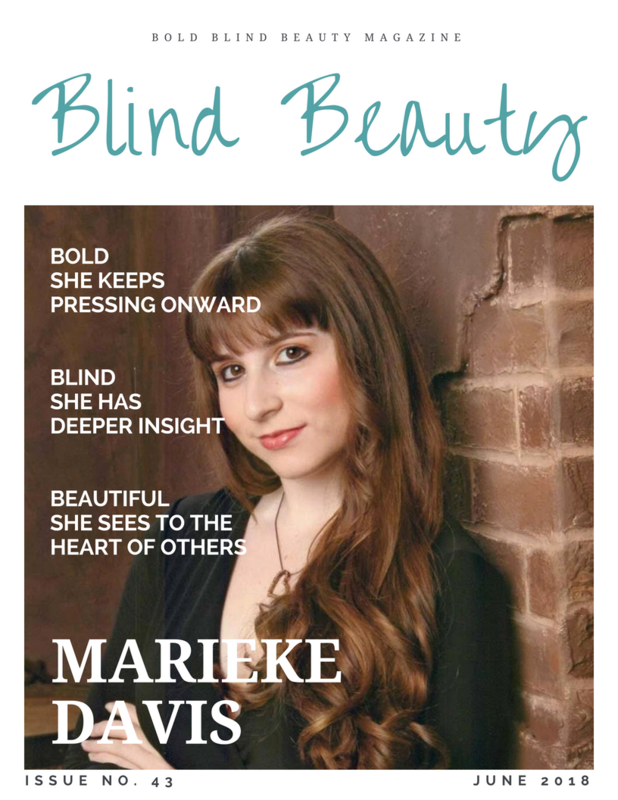 Featured image is a mock magazine cover titled Blind Beauty. 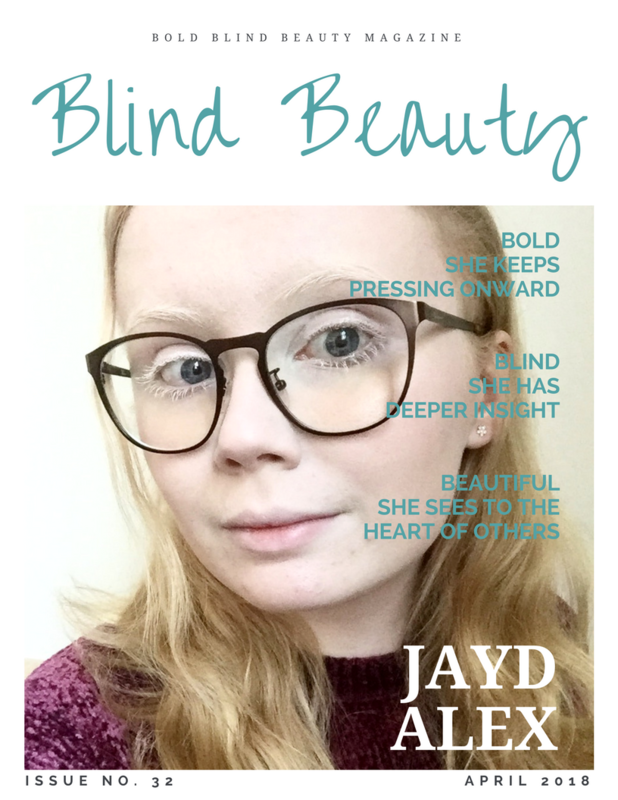 Jayd is looking quite lovely on the cover with her fair porcelain complexion wearing brown-framed eyeglasses. She has light blonde shoulder length hair, blue/grey eyes and is wearing a burgundy crew neck sweater.